Bidding farewell to memories of a dark, frosty winter and embracing the long, summer days, the people of Saint Petersburg, Russia enjoy “white nights” every May through July. Due to the city’s latitude, during this period the sun only sets for a few hours each day with some nights only seeing a hazy twilight. Energized and grateful, the locals have devised a number of ways to celebrate the extra hours of light. The city of Saint Petersburg hosts the White Nights Festival which features the “Stars of White Nights” program at the Mariinsky Theatre consisting of a series of classical ballet, opera and orchestral performances, and numerous carnivals and concerts throughout the city and its suburbs. But of the many events, the most famous public celebration is Scarlet Sails which takes place the weekend closest to the summer solstice. 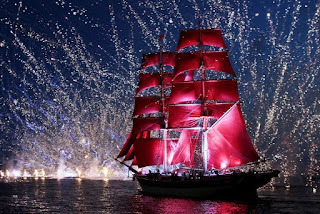 Scarlet Sails, or “Alye Parusa” in Russian, is a late-night affair centered around a tall wooden ship with scarlet-illuminated sails navigating down the Neva River with the backdrop of a spectacular fireworks and light show. The city’s main drawbridges open for the sail which takes place after midnight and attracts several million onlookers annually. The tradition, commemorating the end of the school year, began in Saint Petersburg after the end of World War II. The legend surrounding the event is tied to a novel with the same name which tells the story of a young girl who is promised by a wizard that one day a prince will come on a ship with scarlet sails and carry her away. Enjoying the display from the comfort of a dinner boat. The Volga-Volga restaurant is housed on a two-story riverboat with an open top deck and enclosed lower level. A full bar and dinner menu become available at 10 p.m. and guests can enjoy live entertainment on the boat which undocks for a short period during the evening. The Gollandec is a stationary restaurant set on a ship and has a special prearranged food and drink menu for the event. Viewing the sails from an aerial perspective. Professional roofers gather small groups to admire the evening’s festivities from one of the many building rooftops along the river. The viewing area is flat but revelers should take caution of the height and dress appropriately. Braving the crowds along the embankment. While several areas are reserved for Russian graduates, if you are able to stake out a spot early enough, it’s possible to find a place along the river’s edge to partake in the festivities. If you elect to go this route, ensure you bring identification and if you are visiting from another country, your passport or at minimum a copy of your photo and visa page. Police stage barricades closing many streets to both vehicle and pedestrian traffic throughout the day and night. However you decide to view Scarlet Sails and enjoy white nights, the experience is sure to be unforgettable and will undoubtedly affirm the notion that Russians know how to put on a breath-taking show.